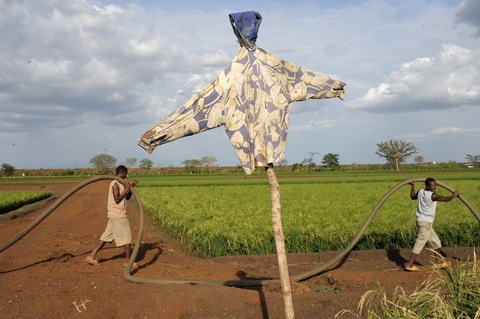 Men move pipes at the Saudi Star rice farm in Gambella, Ethiopia. Photo by Dallas McNamara. In an effort to clear land for investors and help boost Ethiopia’s economy, the government in the East African nation is relocating farmers from land they’ve used for decades, sometimes against their will. Reporter Cassandra Herrman reports on Tuesday’s NewsHour about how the “villagization” plan is affecting people in one farming community. “Land is political; land is very emotional. And land is our identity,” said Anuak leader Okok Ojulu, whose vocal resistance to a Saudi-owned rice farm displacing the village’s farmers led him to flee to neighboring Kenya in fear of his life. Herrman’s report about the Anuak people of the Gambella region in western Ethiopia is part of the “Food for 9 Billion” series, a multi-platform media project examining the challenge of feeding the world at a time of rapid social and environmental change. The project is a collaboration with Homelands Productions, the Center for Investigative Reporting, American Public Media’s “Marketplace” and the PBS NewsHour. View all of our World coverage and follow us on Twitter.